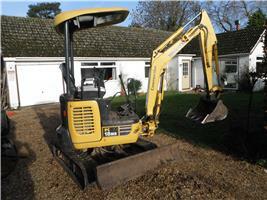 Philip Stallard, Mini Diggers, Landscaping, Groundworks - Driveways/Patios/Paths, Hire Services based in Burgate Manor Farm, Hampshire. Phil Stallard OFF ROAD parking and driveways, mini digger work, shingled driveways, block paving, paths, patios, landscaping, artificial grass laid, footings/foundations, garden clearance, all types of fencing and gates, tree and hedge clearance, brick walls constructed, demolition. All work carried out by myself not contracted out or left to a workforce it may take a little longer to complete but it will be the best.